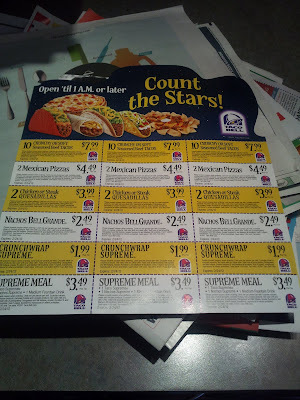 If you get the Chicago Tribune, there's a sheet of Taco Bell coupons in today's paper. Get it, use it, love it ... probably get heartburn. Nothing I can do about that. That's pretty sweet! I still love me some Taco Bell although I try to go "classy" when I can and get Chipotle or Taco Fresco or stop at a more locally-owned fast food Mexican place.